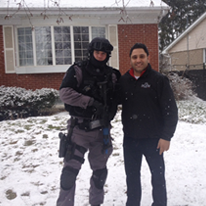 BURLINGTON, ON – DCAM HOMES partnered with the Halton Regional Police and to show their support for safe communities on Wednesday, March 13. ETF police officers used an old home scheduled to be demolished to practice tactical rescue drills. The event was a great display of community support and put big smiles on the faces of a group of excited kids that witnessed first-hand emergency response officers breaking through the door of the old, vacant house near North Shore Boulevard. Officers searched the house to locate a medical dummy hidden inside, which EMS workers practiced resuscitating. The training was a great success for everyone involved. DCAM HOMES is pleased to have been able to assist local police and ETF services with this event and will continue to support and work with them to build safer communities in the coming years.